West Windsor, N.J. - When Allanna Hicks, who earned her associate degree in Liberal Arts at Mercer in December, heard about the college's Study Tour to Paris scheduled for July, she remembers thinking, "I'm in." Now, having just returned from the trip, which took place July 10-17, she is thrilled she decided to go. "I so enjoyed it. I really appreciated the exposure to the culture. I learned a lot in school, but studying a culture firsthand with faculty and a guide makes a huge difference." Hicks had never been abroad before and now she can't wait to go back. That sentiment was echoed by others on the trip. The eight students were accompanied by MCCC science faculty members Diane Hilker and Linda Gaylo. Their very full itinerary included Notre Dame Cathedral, the Pasteur Museum, Versailles, the Napoleon Museum, the Louvre, a Seine River cruise, and a view of Paris from the top of the Eiffel Tour, complete with a champagne toast. On trips into the countryside, students observed the cheese-making process and made their own goat cheese -"an acquired taste," observed Plant Science major Nicole Bailey with a wrinkle of her nose. The group also visited two wineries - one that dates to the 11th century and a second that dates to the 14th century. They were even there for Bastille Day - fireworks included. Students note that the details of the trip were meticulously attended to by Casterbridge Tours and their guide, Alan. "We left the hotel by 8:30 every morning and Alan would hand us our metro passes," Hicks recalled. "We also did a lot of walking, which is a great way to see the sights." At the Pasteur Institute, from left, MCCC students Nicole Bailey and De'Ana Leonard (partial view), faculty member Linda Gaylo, students Diana Bridgeforth, Allana Hicks,Dorothy Edwards, Annette Bacon, Linda Cruzeta and faculty member Diane Hilker. Not pictured: Harriet Jones. Student Annette Bacon wishes to dispel a major stereotype about the French and their attitude towards Americans. "If they saw that you were trying to speak French, they were friendly and very helpful," she said. Annette, who traveled with her mother, Harriet Jones, admits to taking at least 1,000 photos. "I just could not believe the architecture of the place," she said, especially Versailles. She was also impressed with the impressionist art. Her mother vividly recalls the street performers, particularly a singer in the metro station who insisted on serenading her with Whitney Houston's "I Will Always Love You." "He was a real flirt," she recalls with a wide grin. French food clearly lived up to its reputation. Some students tried - and liked - escargot, while everyone enjoyed starting their day with fresh croissants. Favorite desserts included crepes, mousse and crème brulee. Wine proved cheaper than coffee. There was lots of pate on the menu, as well as steak. But, observed Professor Hilker, portion sizes were much smaller than in the United States. Even Bailey, a vegetarian, found plenty on the French menu that suited her, including quiches, omelettes, a variety of salads, and the bread, of course. Bailey was especially thrilled to visit the Pasteur Museum, having written a paper about the world famous scientist prior to going on the trip. "I wrote the paper, and then I got to see the actual lab," she said. Bailey presented her paper to her fellow travelers following the museum tour. She also recalled the trips into the French countryside with wonder. "The scenery was so beautiful." Bailey noted that it helped to travel with such a congenial group. "We got along great. We became really good friends." Both professors agree that traveling to another country is a unique bonding and learning experience. Said Hilker, "The study abroad trip provided the students with a wonderful opportunity to experience Parisian culture and to learn more about how the field of microbiology is interwoven into our everyday life." Adds Gaylo, "Our experiences exceeded everyone's expectations. The educational opportunity at the Institut Pasteur was a thrill even for those travelers who have never studied microbiology. 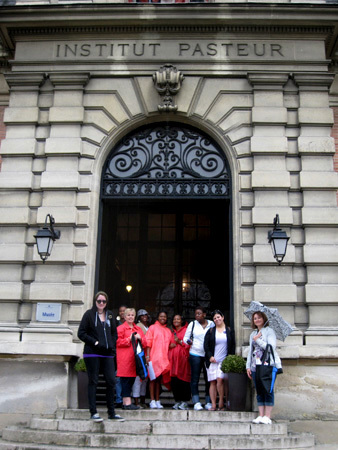 Our overall appreciation of French history and culture was definitely enhanced by this trip." The Study Tours program is coordinated by Business faculty member Andrea Lynch. Plans for future tours will be announced soon. For more information about study abroad options at Mercer, click here.